One trade show may be the biggest single event in an entire year for a company. Trade shows are a time to promote your brand, network with others and grow your list of prospective clients. They're also often the culmination of months or even years of work. One of the aspects of exhibiting at a trade show that requires substantial attention and effort is trade show booth layout. The design of your display has a tremendous effect on how many contacts you make and the impressions the people you meet get about your brand. Making sure you understand what makes a good booth design and working with a professional trade show signage company can go a long way toward making your trade show trip a success. Here are the various types of trade show booths you may encounter at the typical trade show. Linear inline booths are the smallest of the display types and typically measure either 10' x 10', 10' x 20' or 10' x 30'. They often also have eight-foot height restrictions. They are rather flat compared to other designs and open in the front. Peninsula displays, also called end-cap booths, are medium-sized trade show booths, and are usually around 20' x 20' or more. They open on three sides and are often on the end of a row of linear inline stalls. Island displays are the largest of these three primary types and are at least 20' x 20', but are sometimes much more extensive. They stand alone and allow access from any side. Rather than being against a wall, they are in the middle of an open space. They typically don't have the same height restrictions as other kinds of booths, enabling you to hang items from the ceiling or stand tall items within your space. Of course, you don't have to stick to these three templates, unless trade show rules say you must. Some shows will give you the freedom to get more creative. The design elements within your booth are another essential consideration. Your stand might contain banners, wall backdrops, towers, hanging structures, tables, chairs, counters, meeting spaces, product displays, media kiosks, storage space and much more. What you include is up to your imagination, trade show rules and your budget. So, how do you know which type of design is right for you, and how you should set up your display? The biggest driver of what makes the most sense for you will be your goals in attending the trade show. Do you want to generate leads? Land sales? Increase brand awareness? Network with potential partner companies? When planning your booth, always keep your goals in mind. Make sure to clue in any companies you're working with on your display, too. How can you make sure to accomplish those goals? Booth layout plays a big part. Keep reading for trade show layout design tips that will help you wow visitors and have you meeting — and exceeding — your goals for your next show. To start with, here are five general guidelines for success. An essential aspect of the design of your trade show booth is the way it encourages traffic to flow. You want to make sure you get the right people to your display and keep them around for the ideal amount of time — which depends on your goals. You want them to spend enough time with you that you can discuss the highlights of working with your company, but not so much that your booth gets overcrowded.Make sure people can easily approach your booth and talk to a representative if they want to. For example, you don't want to create an unnecessary barrier between your staff and your customers by putting a table and chairs in front of where your employees are standing.Think about the flow of your booth the same way you think about your marketing funnel. You want to use your signage to pre-qualify prospects before they come to your booth and have the most qualified prospects spend the most time at your display. Trade shows are a perfect opportunity to increase brand awareness, but even if that's not your main goal, you should always make sure your display is consistent with your brand. Every part of your layout should work well with your brand identity, colors, logo and other aspects. Don't include any features that contradict how your company is trying to represent itself.To help with branding your layout, you should prominently display your company name, logo and a brief description of who you are and what you do. Which piece is most prominent depends on how well-established your brand is.People immediately recognize big names like Google, Target, Facebook, Nike and others from their logos alone. Smaller companies, however, should make their description the most prominent part of their display, since most visitors won't know what your logo or name represents. Craft a brief, catchy description of yourself that clearly describes who you are and what you do. Your copy should be succinct enough that people walking by can get a basic understanding of who you are. Qualified prospects will then want to know more. You may also want to include in your booth some elements that will draw a crowd. If you have a crowd around your booth, this will bring more attention to you and encourage others to visit you.Some of these fun, engaging elements include giveaways, games, exciting product demonstrations and unique designs. You can also integrate technology. You could offer free Wi-Fi and phone chargers, for example. You could also use QR codes or even create a virtual reality or augmented reality experience for visitors to try.It's important to remember these features are designed to attract crowds, not convert prospects. If brand awareness is your primary goal, you might put more focus on these fun elements. It getting leads or sales is your main objective, make sure these crowds don't take up all your space, as this can discourage more qualified prospects from spending time at your booth. You have nearly endless options when it comes to trade booth layouts, but you don't want your design to be too busy. It's important to pick a few elements to focus on and stick with them.Picking what you want the takeaway for visitors to be can help with this. Choose one thing you want people to remember after they leave your booth and make that a prominent aspect of your trade show booth design. This takeaway could be a problem you solve for your customers, the fact that you're releasing a new product or the idea that your booth was the most fun one at the show.When creating your layout, choose a theme and stick with it. This theme can be something about your company or something captivating like the beach or outer space. Just make sure it's relevant to your brand. Visually, you always want to keep things relatively simple. To make your display easier to process, don't use too many different pictures, colors or fonts. One helpful rule of thumb to remember is that your design should be 40 percent white space. It's tempting to pack all your space with content, but if you give it some room to breathe, the elements you do use will have a more significant impact. You want your design to be easy to take in, so you should also use easy-to-read fonts. Sans serifs are typically the most easily legible. Lighting is also critical to this. You can use it to make your design more readily visible and highlight the most crucial parts of it. Don't make attendees work to understand your booth. Make it as easy on them as possible. In all the hype about making an engaging design, it's easy to forget about the less exciting, practical elements. Don't forget about things such as storage or meeting space in your layout.If you're giving away product samples or giving product demonstrations, you need to make sure you have enough room to store everything you'll need out of sight, as boxes of these items can be unsightly and take away from the feel of your design. You'll also need a hidden storage area for personal items like coats and umbrellas.If you want to spend longer periods talking to prospects in your booth, set aside space for a semi-private meeting area. That might not be feasible for smaller designs, but if you have enough room, it can have a considerable impact on the number of leads you acquire. You can allow people to see you having these meetings, but make sure there is at least some privacy and that they don't obstruct the flow of traffic. The amount of space you have will limit what you can do with your layout in some ways, but a large trade show booth is not necessarily better than a small one. A small, well-laid-out booth can have much more impact than a poorly designed large one. Part of getting ready for your trade show will be choosing the ideal size for your setup. Your budget, your goals and what function you want your space to serve will help determine the right size for you. Before choosing a size, map out everything you want to include in your booth. Don't forget to consider storage space, space for displayed products, meeting space and room for people. For each staff member, set aside around 40 to 50 square feet. Leaving less than that will make your space feel crowded. A more open layout will be more inviting. You'll also need to consider the crowds you're aiming to attract and whether they'll be inside or outside your booth space. For a gathering in which people stand about an arm's length apart, you need 10 square feet for each person. For a tightly packed crowd, you need about five square feet for each person. Don't forget about height when designing your layout. Building vertically as well as horizontally can help you take full advantage of your space. Include graphics people will be able to see from long-range, medium-range and up close. Put your long-range graphics as high as you can, medium-range ones at around six to eight feet off the ground and short-range ones at about five to six feet high. If your space is too small to fit everything you want comfortably, think outside the booth. Put more of your focus on pre-show promotion to draw more people to your setup, as well as post-show interactions to make those connections count. Also, make sure you train your staff on how to be efficient at moving people through the booth. You can also use technology, such as QR codes and social media, to expand your presence beyond the physical limits of your space. Additionally, take advantage of the other things the trade show has to offer. Spend time at meet-and-greets and presentations, and maybe even see if a representative from your company can give a presentation. You can set up private meetings and events as well. A lot of trade shows take place indoors, but if you're participating in an outdoor trade show, you'll need to take that into account. First of all, you'll need to prepare for the elements. Make sure you use supplies that will be OK if they get wet, or have something on hand to cover them with in case it starts raining. Also, make sure to secure all your items in case the wind picks up. You don't want to spend valuable trade show time chasing down parts of your display. If it's likely to be hot and sunny out, take advantage of that fact by having a shaded booth and giving away things like branded water bottles, sunglasses, and hats. People will appreciate your giveaways and may come into your booth for a break from the heat. While a well-designed trade show booth can play a huge part in your trade show success, you also need to make sure you're ready to market yourself before attending a show. Perhaps one of the most important trade show tips for exhibitors is that the focus should be on networking, rather than selling. These kinds of events are generally better for getting leads and building relationships with potential customers and partners than closing sales. Before the show, start reaching out to attendees so you can promote the fact that you'll be there. Doing so might encourage your contacts to attend and will put you on the radars of those who do come out. You can also set up meetings for the event in advance. If you have a big current or potential customer, you could even buy them a ticket. Social networking is another great promotional tool for trade show attendees. Tweet pictures from the show, tag other attendees and use the show hashtags to give yourself more online visibility. The interactions you have after the show with the contacts you made there are just as crucial as the ones you had with them at the event. Give them enough time to travel and get settled after the show, then reach out so you can keep that connection alive. Of course, you should also measure the return on investment, or ROI, of your trade show appearance. Keep track of what went well and what didn't, so you can improve for your next event. If this is the first time you'll be exhibiting at a trade show, you probably have a lot of questions. All the above tips apply to you, but it's especially important to remember you won't get everything right the first time. That's why it's vital to keep track of your ROI and use that information to improve at each trade show appearance. Learning about what others in your industry are doing is one of the most valuable parts of going to trade shows for any attendee. For first-time exhibitors, though, this will be especially important. Take time to walk around and explore the booths of the other exhibitors. Take notes about what they're doing well and what isn't working for them. Then, you can incorporate these insights into your next trade show booth layout. Another helpful tip is to feel free to ask the show's organizers any questions you have. Different events have different rules and processes, so it's best to ask for clarification if you're not sure about something. Whether you're planning for your first or next trade show appearance, working with an experienced trade show display company can help. We provide large-format trade show graphics, as well as other materials — such as business cards, brochures and catalogs — you can hand out at events. Contact us today to talk to a trade show signage expert or request a free quote here. Your business card is your passport to new contacts and more clients. It is the embodiment of your company's brand identity that functions as a two-dimensional representation of your talents and achievements. And yes, it's only a few inches wide. Are you feeling a little overwhelmed by the prospect of designing new business cards after reading all that? You don't have to be. A good business card conveys lots of information in a small space with a bit of spirit and character. If you've ever wondered what to put on a business card for networking, read on to learn the answers — then contact Avanti Printing to get your new cards. The most essential quality of a good business card is its usability. You want people to be able to look at it and glean all the pertinent information about you, including your name, your company's name and what your business does. You can get caught up in the design elements of the card easily, but in reality, the simpler the business card, the higher the chance someone will use it to contact you. Increasingly, people also include their social media account URLs, too — but only add these if they serve a professional purpose. A potential business contact doesn't need the URL of your Instagram account filled with pictures of your adorable puppy. However, they might appreciate the URL for your profile on LinkedIn. How Do You Make Your Business Card Stand Out? Of course, there is a fine line between a dull yet proficient business card and a fun one. It's okay to mix in elements of fun, when appropriate. But generally, you want your business card to look professional. Within those constraints, you can find ways to help it be memorable. For example, you may want to incorporate a company slogan or your motto on your card. Does your company have a mission statement? Print it on the back of your cards. Use an approach that will make you seem distinctive without being gimmicky. Think about your industry and what sets you apart from your competitors, and play off those elements, too. If your industry allows for a non-traditional approach, consider various types of materials other than cardstock; things like plastic, metal or special printing techniques can be used. Should You Include Images on a Business Card? Images can be a great way to attract attention and brand yourself. If you have a company logo, you should include it on your business card. By putting your logo on a variety of marketing materials — such as your brochures and banners — you will create a cohesive identity for your company. This improves your trustworthiness to potential customers, who can see you have put time and effort into planning your marketing efforts. That type of organization speaks well of your business. While including your logo and perhaps another small image can be a good idea, don't get too graphic-focused on your business cards. The things you want to highlight are your contact information and website. If you think graphics may distract from that, then don't include them. Instead, stick to simpler designs that highlight the words on your card. Finally, make sure any images you do include are high-quality photos that will reproduce well. Sharp pictures work, but blurry or "artsy" ones do not. Still not feeling 100 percent confident with your business card design capabilities? Enlist the assistance of Avanti Printing. We offer help with creative and design elements for business cards, as well as other printed products. We can also take care of large orders and offer short turnaround times for our clients. Contact us today to request a quote for your business card project. In the digital era, you may expect that all commercial printing projects are done digitally these days — but that is not true. In some cases, you will get a better final product when you use offset printing. 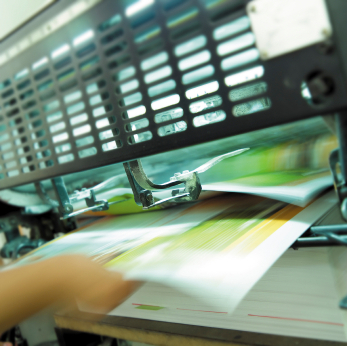 What is offset printing, and how does it differ from digital printing? Offset printing is a style that employs aluminum plates to print a picture onto a rubber "blanket." The rubber then rolls the image onto a sheet of paper. The method is called offset printing because the plates do not actually touch the paper with the final image. Offset printing is the best choice when you have a high-quantity print order. People often compliment the color quality and clean lines indicative of this type of printing. What Is the Difference Between Offset Printing vs. Digital? Digital printing allows you to print only what you need. You can do just a few copies of a brochure or card, whereas you have a minimum production number for offset. You can use lots of different types of paper for offset printing, with varying textures and thickness. Should Your Business Use Digital or Offset Printing? The answer to this question depends on what you need to print. For example, say you're printing holiday cards to send to your customers. If you have a relatively small list of people to send to — such as 100 or less — and you want to have each client's name printed on their card, then digital printing would be the best method. You can set up a smaller production run and include the variable information of the names. If, however, you plan to send cards to more than 1000 people and want some metallic colors on the card to make them stand out, then go with offset printing. Remember, the more you print for an offset printing run, the cheaper it becomes per card. Understanding the difference between offset and digital printing can help you save money and make the right choice for your business. Avanti Printing can also assist you in making a decision. Contact us today to get a quote for your project. They are called "clamshells" because, of course, they resemble a clamshell, which hinges in the middle and can open quite wide. Clamshell packaging provides a practical solution to the problem of how to transport products with lots of small parts. It also offers security measures other forms of packaging do not. This unique form of design can be the perfect way to package some products. If your product consists of a bunch of loose pieces bundled together for sale, then clamshell packages may be the right solution for you. What Are Clamshell Packages Made of? Thermoformed plastic is one popular option. This material is custom cut and fitted to the contours of your product. Say, for instance, you sell air fresheners that plug into a wall socket. They have an odd shape that doesn't fit premade clamshell packaging. The freshener would rattle around in a square box, and you want something that will cushion the freshener and protect it. Fortunately, you can custom-mold thermoformed plastic to fit your product perfectly. This is especially useful for fragile products or ones with lots of accompanying parts. Why Should You Use Clamshell Packages? Security: The first advantage, and perhaps the least obvious, is security. Clamshell packaging can be difficult to open. Have you ever noticed how hard it is to pull apart the two ends on a custom package for an electronic device? That's by design. It makes it more difficult for people to rip open in a store or swipe without calling attention. Visibility: Another excellent reason behind using clamshell packaging is the visibility it gives your product. The best packages entice people to purchase the product, and clamshell packaging does an exceptional job of showing off your product. So, for example, if you sell blueberries, people can see what the berries look like before they buy them. Portability: Clamshell packaging can also keep your product safe during transport. Most products have a journey to endure from your facility to the retailer selling them. You want them to stay safe and intact during that trip since people will be able to see the product through your packaging when it arrives. If it's broken or cracked, no one will want to buy it. Custom clamshell packaging protects your product on its trek to the retailer. What Types of Products Employ Clamshell Packages? Restaurants also use clamshell packaging to send leftovers home with guests or house fast food products. They will often purchase standard stock packaging, since leftovers do not require the sort of custom design as, say, a screwdriver or nails. Why Choose Avanti Printing for Your Clamshell Packages? At Avanti Printing, we have experience making custom clamshell packaging for our customers. Whether you sell food, hardware or something else entirely, we can come up with a way to package your product that will highlight its best design features while also enticing potential buyers into looking at it more closely. Most importantly, we can do this with a design that keeps your product safe. Working with Avanti Printing has many advantages. We provide fast turnaround times for your busy business, and we can take on large orders, too. We'll also assist you in the creative and design process to get you the clamshell packaging you want. Reach out to us today to get a quote for your packaging project. The function and effectiveness of your product matters, but the packaging that product comes in matters nearly as much. Effective packaging design helps sell a product. It persuades people they want to buy it and convinces them to take it off the shelf and bring it home. By implementing retail packaging improvements, you may be able to increase the sales of your product and connect with more satisfied customers. Employ these five retail packaging tips to improve your sales numbers. Packaging may sound like it's separate from marketing, but it's not. In fact, packaging plays an essential role in marketing. You want your product to have the same look as your marketing materials, so you present a consistent image. You want things like your logo and slogans to be the same on your packaging as they are on your website and printed brochures. You need your packaging to stand out on store shelves. Take a look at the competition to see what they do. Then, come up with ideas that will set you apart. You want different colors, attractive designs and even a unique shape for your packaging to ensure you draw people's eyes. When they're new to design, people tend to want to make things complicated. They think the more intricate the package, the better. However, when it comes to packaging, the opposite is often true. People want simplicity — they want to be able to see what they're buying. They want the product to speak for itself, and they do not want to be distracted by a bunch of artwork or words. Make the product itself the star of the show, and go easy on the additional flashes of creativity. You want the person who buys your product to be able to open it easily, too. Keep that in mind when you fashion your tops and bottoms. Branding tells your customers what you're all about by speaking to your company's mission and values. Make sure your packaging matches up with your branding, too. For instance, if part of your branding is that you're a green company that pushes an eco-conscious lifestyle, then your packaging should consist of recycled or recyclable materials. You don't want your packaging causing pollution, because that goes directly against your brand — no matter what the product is. Not sure where to get started on implementing our packaging design tips? Get in touch with us today to discuss your options or request a quote. The curb appeal of your restaurant can only go so far in drawing in guests. The actual heavy lifting is done by the menu. How do you write a menu that drives up your profits? Learning how to make a restaurant menu work like a sales representative requires understanding how much potential your menu has in the first place. A menu effortlessly accomplishes what all advertising campaigns can only dream of: it holds the attention of every patron or potential patron who wanders into your funnel. This means your menu may be the greatest weapon for increasing profits of any item in your arsenal. Most restaurants do not take full advantage of their menu's potential. This is astounding, because it is the ultimate low-hanging fruit in the restaurant industry, giving you the chance to thoughtfully showcase both your brand and your food. Restaurants who engineer their menus can see up to a 15 percent increase in profits right away. This is because, when customers read menus, they are subconsciously reacting to all its details: the feel of the paper, the mood of the font, the tone of the wording and the cost of the items. These details add up to a visceral experience, and in the case of potential customers, a split-second decision. You want the result of that decision to be, "Let's eat here!" How profitable is the item? How popular is the item? The answers to these questions will affect how you present the item and where you place it on the menu. Re-engineering your menu pays off not only because it is immediately profitable, but also because it is a practice you can apply and continue to perfect as you go along. The determining factor on whether menu engineering will work does not depend on the type of restaurant — it depends on the amount of time and effort you put into it. There's no doubt about it: taking the following steps will require a time investment. However, at the end of the process, you'll be left with a menu that actively works with your customers' natural tendencies, not against them. By following these steps, you put your most profitable and popular items in places where customers naturally tend to look first. There are parts of the menu people avoid and parts they tend to hover on. Having a firm understanding of which items earn the most profit gives you a more proactive ability to decide where they should appear on the page. This first item is the most important part of this whole process. Costing your menu involves taking every menu item and adding up the exact cost of its production. Note that you must account for everything to the nearest penny — how many ounces of meat, rice, spices and everything else that goes into it — in order to do this effectively. Do not take labor into consideration for this step. What you are concerned with is merely the price of the raw materials going into each dish. We recommend that whoever begins the process of costing the menu should follow-through with the menu engineering process to the end. Having an intricate knowledge of the ingredients comprising each menu item is extremely valuable during the rest of the process. There is also a relativistic factor at play. Different people will not cost menus the same way, leading to inconsistent takes on profitability. You'll be comforted to know that four out of five restaurants do not cost their menus, and 25 percent of those who do cost their menus do so the wrong way. This process takes time, but the fortunate side effect is that it puts you ahead of 80 percent of your competition. The more care you put into it, the better off you will be. Once you have accounted for the costs of every item on your menu, it's time to plan out your sales mix. What Is a Sales Mix in a Restaurant? Also referred to as a "menu mix," the sales mix predicts the cost of your food as compared to the margin of profit you'll make off of it. This is a helpful metric for judging the predicted cost of your food and the profit you'll make after you've sold it. Furthermore, it allows you to compare your projected costs to the actual costs after serving the item. As an example of a sales mix, let's say you are comparing two items: a filet mignon and chicken alfredo. The filet mignon costs $12 to make, but you will sell it for $24. The chicken alfredo costs $4 and you will sell for $12. That means each filet mignon nets you $12, while each chicken alfredo nets you $8. Let's say you sell 900 filet mignons and just 100 alfredo. That would mean your sales mix showed a net of $11,600. On the other hand, if the filet were a poor seller at just 100 sold and the alfredo flew off the shelves at 900 sold, you'd show a net of just $8,400. The point of this example is to illustrate that it's not always the best idea to prioritize food that costs you less. There is more overhead with expensive items like filet mignon, but there can be a bigger payoff. Avoid falling prey to the notion that you should always prioritize low-cost food. After you've priced out your items, the next step is deciding how to categorize your restaurant menu. Menu item placement is paramount to a successful menu engineering effort, and it starts with organizing your items into categories and sub-categories. Categories are the top level of organization. For instance, a menu might contain the categories "Starters," "Main Courses," "Drinks" and "Desserts." The next step is to break these into sub-categories. When doing this, keep in mind the branding of your establishment. You can use the sub-categories to emphasize your brand and tie in the whole experience. One example would be an English pub whose menu played on British slang or popular tourist sites. It can be helpful to make a spreadsheet to organize your menu items accordingly. A priority graph helps decide the first and last items on a menu. Start with an x-axis and a y-axis. On the x-axis is profitability and on the y-axis is popularity. Flagships: In the upper right-hand quadrant of the graph are the Flagship dishes, which are both wildly popular and highly profitable. Boardwalk: In the upper left-hand quadrant are the Boardwalk dishes, which are still wildly popular but do not create significant profits. Hidden Gems: In the lower right-hand quadrant lie the Hidden Gem dishes, which are quite profitable despite lacking great popularity. No Zone: The No Zone dishes lie in the bottom left quadrant and are neither popular nor profitable. Use this priority graph to group your menu items, but do so in category groupings. That is, place all of your Starters on the quadrants, then your Main Courses, and so on. This allows you to prioritize the items in each category. Then, work through your sub-categories, if applicable. Once you've identified the most popular and profitable items in each section, it will be clear which items to prioritize on your menu. There is a natural temptation to get rid of No Zone dishes, but consider such decisions carefully. A kid's menu item might be a No Zone dish, and even though it is not making you rich, it may be the reason a parent came in and ordered a $25 filet mignon. Now that you have your list, you're ready to start designing your menu. The most obvious first step in designing your restaurant menu layout is identifying your star players — that is, your Flagship dishes. However, there is so much more to creating a well-engineered menu than simply highlighting the Flagship dishes. To start, leave your dishes aside for a moment and consider some qualitative observations about your restaurant. What drives people to dine with you? Is it the happy hour drinks, the seafood, the ambiance? How much time do they spend reading your menu? Is there a general prominent demographic that you serve or is it widely varied? What sort of atmosphere exists in the restaurant? What is the decor like? Spending time giving these questions careful thought will help as we move through the following steps. Let's now consider how restaurant menu spacing affects readers' perusal of your dishes. The human eye can get easily overwhelmed by a surplus of information. That's why utilizing negative space, or space that contains nothing in it, can actually draw the eye. Many menus attempt to cram in as much information as possible, which leaves the eye yearning for a break from visual stimuli. The best way to utilize this technique is with moderation. Specifically, if you have a Flagship item and want to draw attention to it, surround it with negative space. This method is a great way to highlight your most profitable and popular item in each sub-category. Any menu design techniques you use will begin to lose their effectiveness if they are used more than once. Keep that in mind as you begin to lay out photographs, negative spaces and other visual tactics in your menu. One of the biggest items to consider is the use of photographs. First of all, fancier restaurants should avoid photographs altogether, since they cheapen the menu's overall appearance. They do work, though. If used in the proper scenario — think of a cafe, sports bar or casual restaurant — they have been shown to boost the sales of their respective dishes by up to 30 percent. However, photographs are most susceptible of all to the law of diminishing returns — you should not include more than one per page. Fonts, sizes and colors can also be used to great effect. The general rules of thumb are to not mix more than two typefaces, to make sure they are sufficiently different so as not to be mistaken for one another and to let one take the lead. Color can also be used as an accent effect. Picking one color to highlight important words or Flagship dishes can provide a nice pop. Avanti Printing offers graphic design services to help restaurants create the perfect layouts. Readers view lists differently than most people expect. The first items in a list get the most attention, followed by the last item on the list, followed by those in the middle. For this reason, it's a good idea to place your top-rated Flagship item first on the list, then your second-rated item last. Place others in order in the middle of the list. Also, keep lists short. If you have more than six or seven items in one, you should break your menu into more sub-categories. Otherwise, those middle items are going to get no attention whatsoever. One final important rule of thumb: don't drop a list of prices down the side of the page. Customers' eyes will naturally hover on the prices and may result in them choosing the cheapest one on the menu. You want them to focus entirely on the food descriptions. The price should come at the end of the descriptions and should not include a dollar sign. The best menu descriptions use language that paints an image. That's an understatement, though — great menus work hard to make mouths water with the power of the written word. Food descriptions are ultimately what sell the food, and they are responsible for yet another 30 percent increase in sales. A "salmon filet" doesn't sound quite as delicious as a "pan-seared salmon filet." Those extra words put an image in our mind that gets our stomachs hungry. Descriptive language should not be overused, however — it's easy to clog up your writing with too many adjectives. Remember the law of diminishing returns. There are plenty of other useful descriptors besides qualitative adjectives, though. You can attach geographical appeal to food descriptions with words like "Italian," "Mediterranean" and "Cajun." You can also qualify food items with descriptors like "home-style," "age-old recipe" or "small-batch" to add character and appeal to the food items. If a meat or seafood item is grass-fed, free-range, wild-caught or described by any other buzzword, make sure to include it as well. Jumbo Shrimp 'n' Grits: A generous helping of Grandma's steel-cut grits, rich with homemade flavor and topped with five tender, wild-caught jumbo shrimp. Meatloaf and Mashed Potatoes: Mouth-watering meatloaf wrapped in crispy bacon and drizzled in a smoky, tangy sauce. Served over a bed of garlic-butter russet mashed potatoes and seared asparagus spears. The menu cover configuration will give the first impression as to what customers will find inside. Make sure the cover reflects the aesthetic of the establishment, as it will be a decoration on every single table until customers pick it up and open it. One-Panel Menu: This is a classy move to be sure but looks elegant in both fancy restaurants and casual spots alike. The downside is that it does not seem to encourage people to order multiple items. This ultimately means less profit from your guests. Two-Panel Menu: Going by the numbers, the two-panel menu is the best restaurant menu style. If you can fit all of your dishes comfortably into two panels, you should — it's the perfect balance between variety and concision. The two-panel menu also makes dining feel like more of an experience. Three-Panel Menu: If you simply have too many items to fit onto a two-panel menu, try to get them onto a three-panel menu. This option makes it easy for guests to read, but it still does not have the track record of the two-panel menu. Large Restaurant Menu: A large restaurant menu has many pages to flip through and lots of options to choose from. Let's reiterate something here: menu engineering is the act of guiding and influencing your customers' decisions. The more pages there are, the less effectively you can guide them. Understanding how we read restaurant menus — or, more specifically, our eye movement patterns and "scan paths" as we peruse them — is a lovely tool to have in your kit. As it turns out, our eyes do somewhat predictable things when they fall on a menu page. It has long been believed that there is a "sweet spot" in menus — that is, a spot our eyes naturally gravitate towards as soon as we see the page. This sweet spot is thought to be in the upper right-hand quadrant of the page. However, more recent research with retinal eye scanners seems to reveal that we read menus more like a book. We seem to start at the top of the first page and work our way down, doing a bit of scanning mostly on the last page. This new research has not convinced everyone, though. If you are a believer in the sweet spot, it doesn't hurt to try putting a featured item in the upper right. Your first attempt won't be perfect. Your second one likely won't, either. That's completely normal — and it's why you should continuously test your menus and track their performance. If you have a multi-chain restaurant, you can test different versions of the same menu simultaneously — but it's generally best to try tweaking the menu every so often and taking note of the results. Remember that your menu is your advertisement and that everyone is going to read it. It's advisable to always seek improvements. Here at Avanti Printing, we're known for completing high-quality restaurant menu printing with quick turnaround times and at the right price. We know that finding a high-quality printer goes a long way toward achieving a certain look and feel for new menus, and we're here whenever you want to test new menus. We love establishing relationships with our clients and working with them to produce the perfect product. Contact us online or give us a call for a custom quote for your next menu design. Looking for help with the design? We can do that too! Our professional designers are available to help put together a new menu layout. Home printing technology has improved considerably since the days of dot matrix. Today you can buy a consumer brand inkjet printer for a reasonable price and perform your own home-based desktop printing. For a considerably greater investment, a laser printer can improve your home printing even more. However, whether it's an inkjet or laser printer, they still have limitations that you simply cannot get without professional offset printing. Offset printing is a printing technique that uses printing plates, rollers, and a three-color dye process to get the most colorful, vibrant, and professional-looking printing job possible. In fact, offset printing is the most-used printing process today, with over 40% of all printing jobs performed by offset printing. Anytime you pick up a magazine, newspaper, or see a poster for your favorite band, you are seeing offset printing done at its best. Graphics and image printed with offset printing are more vibrant and higher quality. An offset printing job produces sharper images, and the color process offers more richer colors than you can get in an inkjet cartridge. "Bleeding" is the process of printing images or text to the very edge of the paper. Only offset printing can get your business card, post card, catalogue, or poster with full color on every square inch of the paper. Consumer inkjet printers can handle regular sized papers of typical thickness, but only offset printing can get your printing job done on extra glossy paper and larger sizes. When was the last time you could print a full 24x36 inch poster in an inkjet? Offset printing can get the job done on virtually any size paper you need, even custom sizes. Inkjet printing can look good - for a while. Unfortunately, inkjet inks will fade over time, especially when exposed to direct sunlight. Offset printing will last much longer. Ultimately, the inks used in inkjet printing are much more expensive over the long run. Consider a full-color printing using an inkjet cartridge that costs $70. You may only get 70 to 100 prints from the cartridge, costing you up to $1.00 per printed page. 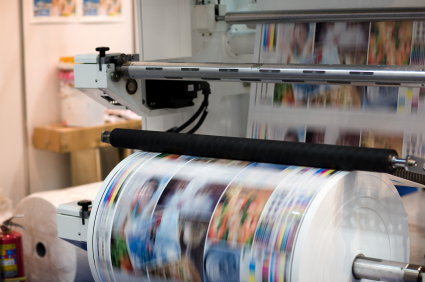 With offset printing, your costs are reduced considerably to only cents per page. For your professional printing needs, choose a printer wisely. Offset printing is the hands-down best choice for getting your printing job done efficiently and cheaply. Brochures are one of the most effective marketing materials that a business can use. Effective brochure printing can highlight the beauty of a product, clarify a business idea, and promote business services. If your business brochure is not making the impact you desired, try using these 4 simple yet creative brochure printing ideas. Brochure printing with lively and eye-catching photographs creates great impact. Be sure to use high-quality photos and images produced by a professional. A professional photographer can capture your product in the best light and angle. You might also try incorporating professional stock images easily found on the internet for your brochure printing. Brochure printing with great images can create a solid impact, but words are what sell people. Before your brochure goes to the printer, make sure you have quality copy. Great copy should be succinct, informative, and persuasive. In addition, be sure to put plenty of white space in a brochure. A brochure with too many words is distracting to most readers who have little attention or time to read a brochure the size of a novella. Use professional writers to develop your brochure copy. The words you use on your brochure printing can be the difference between a glance and a sell. Words make the sell in brochure printing, but they do no good if the reader cannot read them. Your fonts should be readable and in the style of your business and brochure. Standard serif fonts are preferred for conservative businesses. Artsy type companies could use a creative cursive font. Make sure your headings and subheadings are different size as well. Headings should be catchy, but not overbearing. Try different colors for headings to make an even bigger brochure printing impact. Who says your brochure printing job has to be standard size? Some of the best brochures with the most eye-catching impact are of irregular shape. How about a brochure booklet? Some businesses commission a brochure printing in booklet size, such as a small photo album. The booklet is catching, high quality, and represents the unique standards for the business. Or how about a brochure printing on an 8 x 20 inch paper folded like an accordion? Some of the best brochure printing is performed on customized paper. If you can afford it, the extra cost it could add the "oomph" you need to get your brochure noticed.